I would have to agree, sweet potato is the healthier option as it contains a tonne of good stuff, especially vitamins A and C. I cook with these naturally sugary potatoes often, but for this recipe only a good old fashioned potato will do. 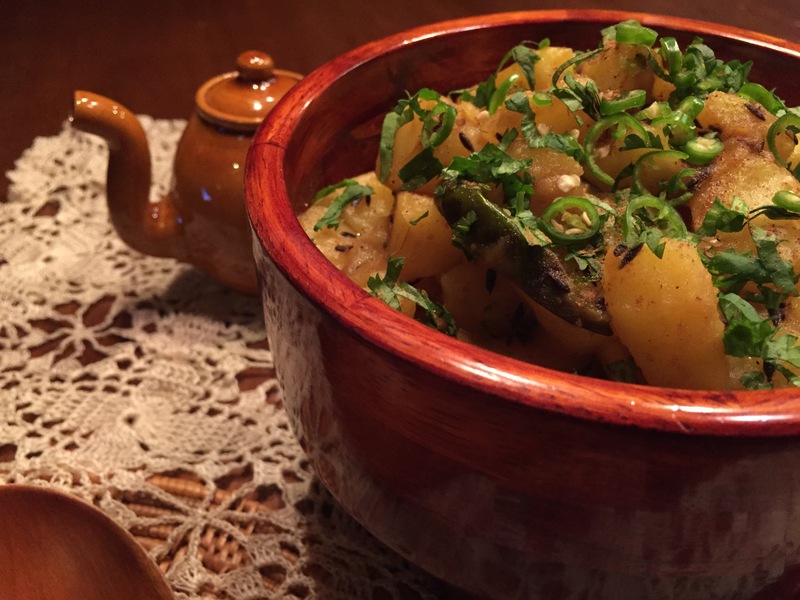 I occasionally cook potatoes much to my husband’s dismay, as he loves them in his curry. 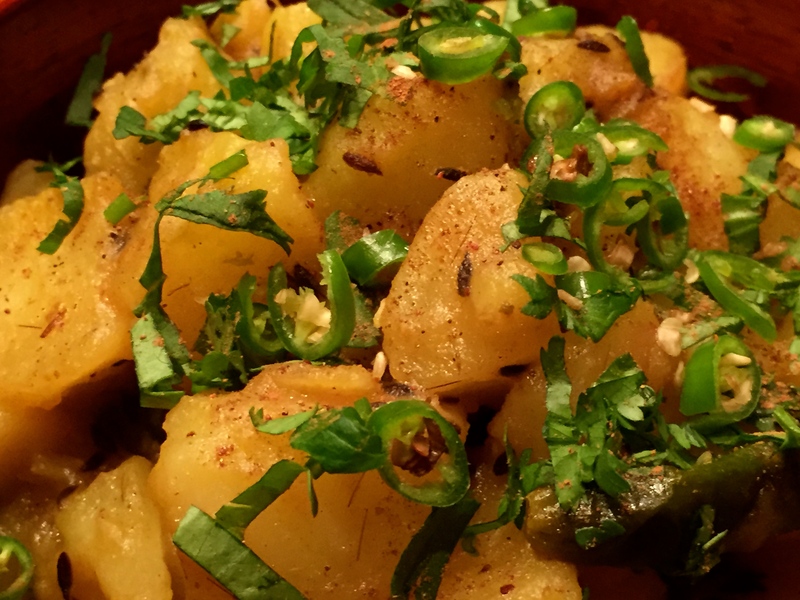 Every now and then I make a potato dish I call ‘batata fry‘. Heat the ghee or oil till it’s very hot but not smoking. Reduce the heat to medium and throw in the cumin seeds and 6 green chilis. Cover slightly as the chilis and cumin seeds will begin to pop profusely. Before the seeds blacken toss in the potatoes. Sprinkle with ground turmeric, ground cumin and sea salt. Stir for a few seconds, cover the pot and reduce the heat to low. 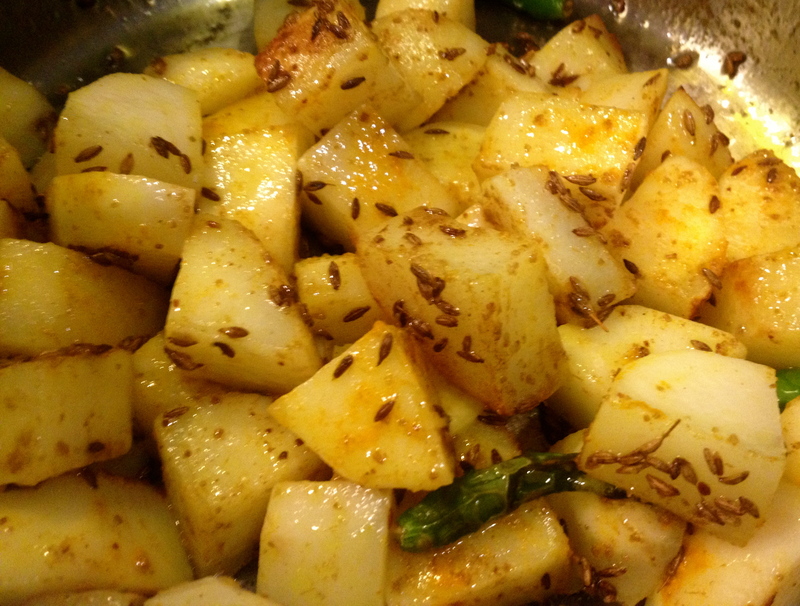 Once the potatoes soften, pour in the water and the tamarind paste. Scoop into a warm bowl. 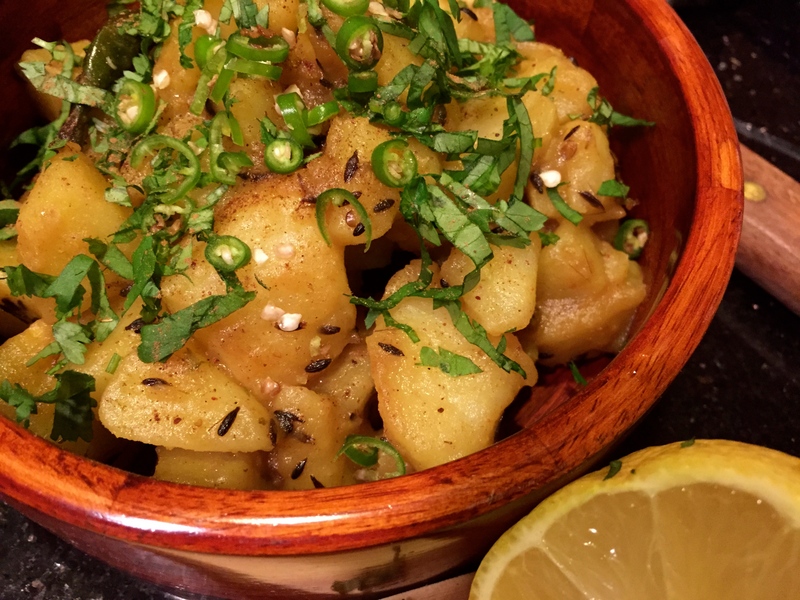 Garnish with cilantro, lemon juice and the gharam masala (if using). Finely chop the last two Thai chilis and scatter over the batata fry. Serve with hot ghee smeared rotis (whole wheat flat bread) and raito (green chili pickle). To avoid the chilis from exploding in the hot oil, make a tiny slit in each one before throwing them in. Depending on the variety of the potato or when the crop was harvested, the potatoes may naturally contain a little or a lot of water. Therefore adjust the water as necessary. I taught a class a few weeks ago and the water I suggested adding was enough for most students. But for some they had to add more water. If you like a thicker creamy curry, gently smash a couple of the potatoes while it’s simmering and add about a 1/2 cup more of water. For brunch, Batata fry tastes great with poached eggs and a crusty thick slab of french bread loaded with butter. Yum! 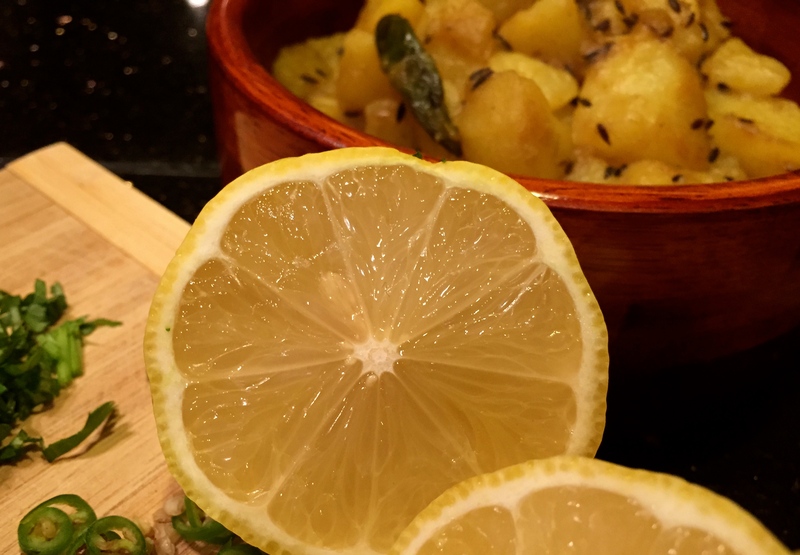 This entry was posted in Breakfast, Curries, Main Course, Vegetarian and tagged brunch, chilis, comfort food, delicious, ghee, gluten free, indian, potatoes, recipe, spice, turmeric, vegan, vegetarian. Bookmark the permalink. I looovvve this too…..I look forward to trying your recipe variation! Thanks Nasimah! 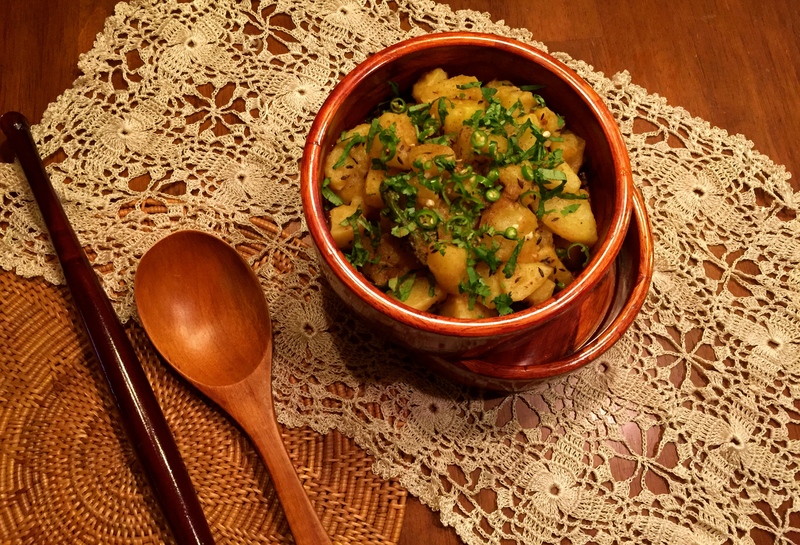 How do you make your potatoes? These potatoes sound absolutely delicious! this does look perfect for a cold winter’s eve! Fragrant. Oh man, these look so delicious I can almost taste them. I am craving them right now even though I am full!! Do you use a non-stick pan for this recipe? Hey thanks HD 🙂 I’m glad I finally got a photo to do the thing I wanted it to do…. make you want to eat it right now! 🙂 I use stainless cookware to cook with, I prefer not to use nonstick, I have a couple of times but not a fan but thats a whole topic I can go off on. I know stainless steel is not for everyone but with a little practice its easy to use. So sorry for replying so late:( I just saw your comment. “ghee soaked roti”? that sounds like heaven! It’s is really delicious! So good 🙂 thanks for stopping by Sarah.